Thai food has a range of tastes to suit all pallets so please don't make the mistake of thinking that all Thai food is spicy. Some dishes are very spicy but there are many which are not spicy at all. Rather, they are a wonderful combination of sweet and sour. Thai dishes are normally shared by all. Thai Cuisine is well-known for being hot and spicy and for its balance of the five fundamental flavors in the overall meal - hot (spicy), sour, sweet, salty, and bitter. Thai food has four regional cuisines corresponding to the four main regions of the country: Northern, Northeastern (or Isan), Central, and Southern, each cuisine featuring locally grown food. Southern curries, for example, tend to contain coconut milk and fresh turmeric, while northeastern dishes often include lime juice. The cuisine of Isan is heavily influenced by Laos. 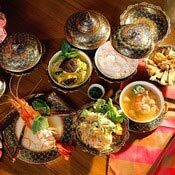 Many popular dishes eaten in Thailand were originally Chinese dishes which were introduced to Thailand mainly by Teochew people who make up the majority of the Thai Chinese. Such dishes include Jok, Kway teow Rad Na, Khao Kha Moo and Khao Mun Gai. Thai food is known for its enthusiastic use of fresh rather than dried herbs and spices as well as fish sauce.